Midem, the world’s music community that will run its annual trade fair January 17-21, has a number of deadlines that allow participants to enjoy generous savings. The next one is Oct 15, after which the entrance fee goes from €625 to €745. If you include attendance at MidemNet, the prices are €1,115 against €1,285. 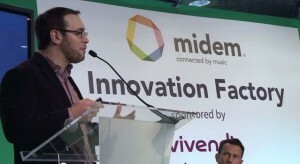 Last year, some 9,000 people attended Midem, which is widely recognised as the foremost trade fair of its kind. In other Midem news, Charles Aznavour is to receive a Lifetime Achievement Award in January. Aznavour has written more than 800 songs, many of which have been interpreted by the world’s greatest artists (Fred Astaire, Shirley Bassey, Ray Charles, Elvis Costello, Bobby Darin, Sammy Davis Junior, Juliette Gréco, Liza Minnelli, Edith Piaf and Nina Simone to name but a few). He has sold more than 100 million albums worldwide, and his career as an actor, which he began in the theatre at the age of nine, includes more than 60 films, including “The Tin Drum,” winner of the Palme d’Or at the Festival de Cannes in 1979.